Happy fuhhh-reaky deaky Friday! We made it!! So did any of you all give up some sleep last night to watch the royal wedding bright & early?! Justin asked me if I was going to get up to watch it live, and I said "h-e-double-hockey-sticks no." I needed my beauty sleep! 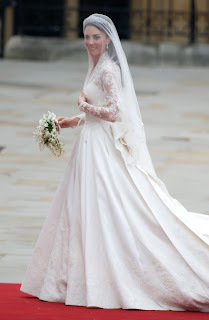 I did, however, rush to the TV & my computer first thing this AM to quickly find a picture of the Duchess of Cambridge's wedding dress! I must say, it was breathtaking! I think she is just classically beautiful. So, my morning was full of indecision. I have the whole day off today to study, but I really didn't have my day mapped out like I usually do. I woke up in the mood to go to my gym for a Spin class, which I haven't done in foooorever, but I couldn't decide if I wanted to go to the morning class, or wait until after my studying to go at night. I love to get my workout out of the way in the morning, whenever possible, but when I read who was teaching the class, my mind was made up. It was my old psycho personal trainer!! (cue the horror music!). Not gonna lie, psycho trainer knows how to teach a mean spin class (that's how I actually chose her to train me in the first place). Unfortunately, after 3 months of training with her, I am now avoiding her like the plague. She did a great job of whipping me into shape, but she kind of made me miserable throughout that time. Psycho trainer made me keep track of every morsel of food I ate, and then proceeded to attack everything on the list. God forbid I should have a carb after 5pm. The kicker was one morning when I came in to train with her at 6am before attending one of her spin classes, and she asked me if I was "feeling gassy?" I instantly started blushing, thinking I accidentally left "an odor," as my grandma would say. When I asked her "why do you ask?" she said, "oh, your stomach just looks bloated." That's right folks. And that is why I broke up with said trainer. I'm getting a little off topic now, so let's get back to it. After several months of turning corners at the gym, I'm not about to voluntarily face her in a spin class just so she can look judging-ly at my semi-ghetto booty and kindly suggest that I stay on for the next class. To my surprise & delight, one of my favorite teachers is teaching tonight's class: Mr. Russell. This guy is soooo great. He shows up in bright neon, head-to-toe workout gear, and plays the cheesiest techno/dance party music throughout the class. As soon as I saw his name on the schedule, it was a done deal. On to the next dilemma, where shall I lock myself inside to study today?? I usually prefer to study at coffee shops, but after my laptop got stolen right out from in front of me before my last finals period (coffee shop to remain unnamed, but they might just serve my favorite frothy skiiiivizzz...), I'm a little bit scurred. Also, I really wanted to bring my own lunch today, and most places don't take kindly to you bringing in your own food. And dark chocolate for some inspiration. Pasta sauce, meet hardwood floor, and my tootsies. **Something to talk about: Do you have an old trainer or exercise instructor who you're avoiding?? I had a really cute personal trainer in Seattle that I could never really work out well with because I was too focused on trying to look cute!